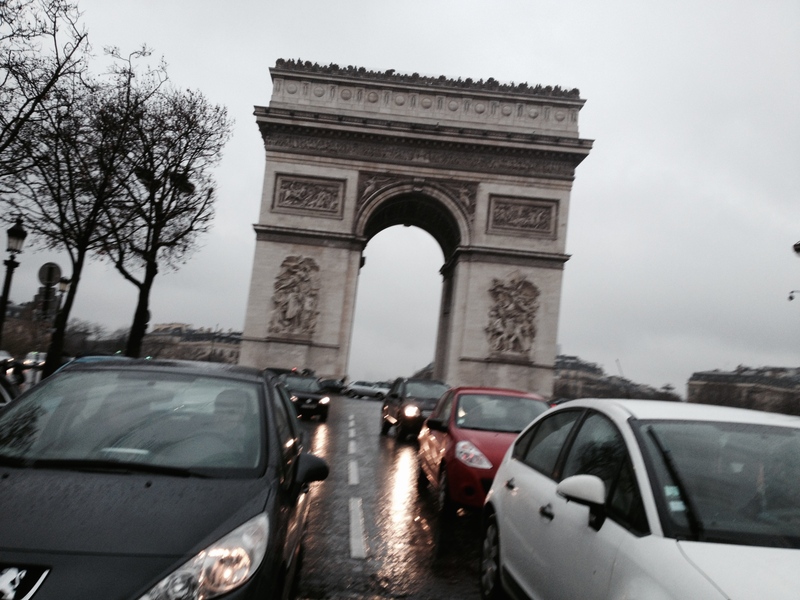 Je suis arrive a Paris! It’s 8pm. My flight landed at 8am, and I’ve not slept. I’ve been super strong – like Captain America strong, holding back jet lag with my mighty shield of walking and drinking an occasional espresso. It’s 8pm and I’ve hit my wall. Easy going during my first day. I had to wait for Dad and T to get to the airport till noon. I coasted through 2 and 3 by walking up towards l’Arc de Triomphe, then down towards George V (A famous, fancy hotel perhaps best known as a setting for the Meg Ryan flick French Kiss). There are tiny things to do, little walks to make, and then it’s 5:30. Time for an early dinner. 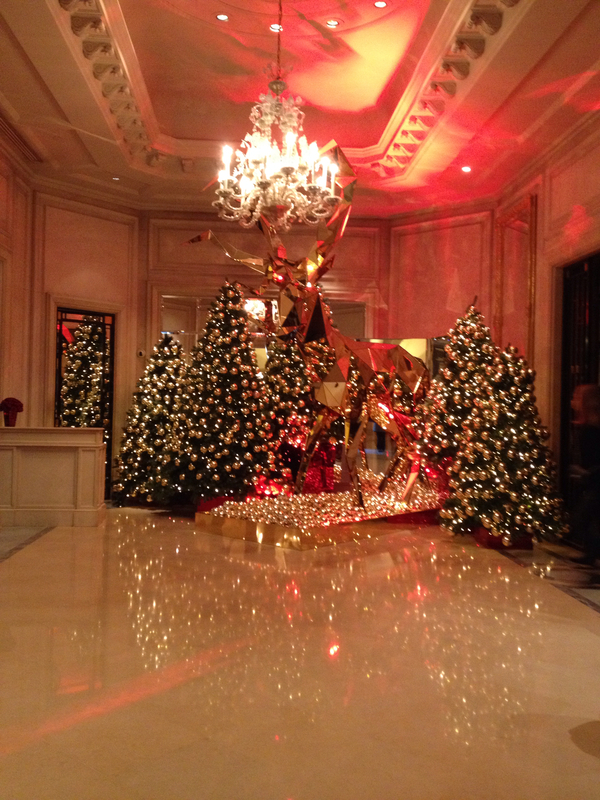 From the interior of the George V. The Concierges are nothing like the snooty French stereotype in French Kiss. There isn’t even a vindictive bell to ring! Sleep settles into your skeletal system, heavy and enticing. You could fall asleep now and life would be perfection. Instead you eat your club sandwich and fail to make conversation. At one point you ask for a bottle of milk instead milk instead of water, though luckily the waitress is occupied and cannot hear you. That’s me – I was just that tired. And so it was I fell asleep at 8pm, and woke up at 12am. I passed out, then woke up at 2:30am and stayed awake for roughly three of the longest hours of my life. I’ve been using this wonderfully distracting app on my phone called “Sleep Cycle.” I bought it as part of a pack that also lets me take my pulse. Sleep Cycle monitors your sleep and gives you a rough idea of how well you are sleeping, based on your movement. I guess the goal is to have a cyclical night’s rest, going into and out of REM sleep in nice, curvy waves. 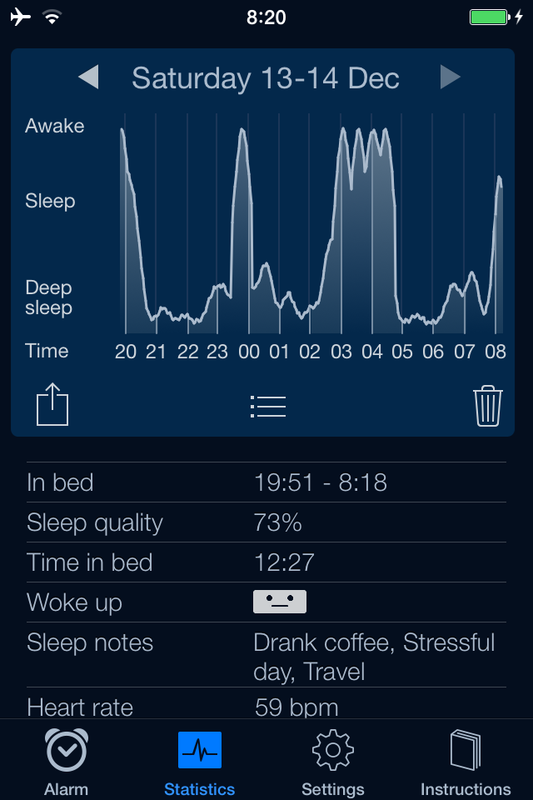 Notice that there really aren’t any cycles – I was either wide awake, or dead to the world. I did not dream. Time was an illusion as I slept, and more so when I was awake. I went through all my worldly problems in half an hour. And then I did it again, because there was nothing else to do and I was clearly not falling asleep. The worst is knowing that when faced with such a jet lag moment, I can’t get up. I can’t, or my sleep cycle will never even out. I’ll pass out at 3pm and wake up at 11pm or something awful like that. So I lay there, playing out all my worst fears over and over. I imagine I will not be pleasant in the morning…if I lived that long, I thought. So though the app says I was in bed for twelve (!) hours, I most certainly did not sleep for all of them. My heart rate was good, though – silver lining! This Post was posted in Observations, Travel and tagged Ceremony, Europe, Fears, France, George V, jet lag, Paris, Sleep Cycle, Sleeping, Travel. Bookmark the permalink.